Join the discussion on our forums! Come discuss Spark Drill over in our dedicated Spark Drill discussion topic. All hate about this card comes from misunderstanding of this expansion tokens idea. Draw your attention to the fact we have three sorts of tokens: goblin bombs to face, microbots to board, sparks to hand. So, the idea of this card is in the removal with handfilling effect for further handcombos. Just try to look on it this way, then try to play it this way, only then blame it (or not). 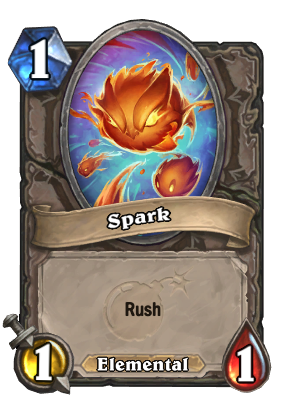 A Steel Rager but you're paying 2 extra Mana to get a Voltaic Burst where you pay the Overload up front, so you are essentially paying 4 mana for two 1/1s with Rush. Wow this is bad. I wouldn't even play it in a N'Zoth Mech Deck. What a terrible card, it's as bad as freeze shaman. Abolute trash. The new rager does the same thing, but at 2 mana less... Should just outright summon the 1/1s upon death to at least have some value. 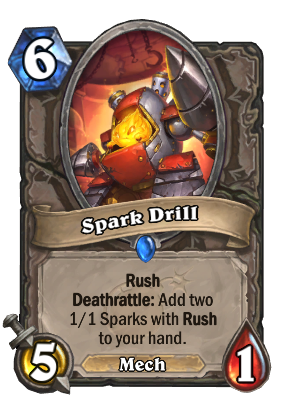 even if that deathrattle was a battlecry and summons sparks instead, the card wouldn't be good. This looks pretty bad but we have to pay attention to the fact that this is a mech and it can be magnetized with something to increase its usefulness. Particularly, Annoy-o-Module, Glow-Tron and Bronze Gatekeeper are good examples of cards that can increase this card's effectiveness. But it is slow and very expensive, indeed. Probably not the best use for a slot in your deck. I can't believe they ripped off Magma Rager's new job at Boom Labs! I swear, in a year or two they'll be coming back with Silverback Patriarch to run their own expansion. It might be decent in arena, not in constructed though. I like the flavor. It's like some of the rushing sparks got a hold of a dangerous machine they have no idea how to control and crash it immediately. Probably one of the worst cards of the expansion. Overall its 8 mana deal 7 damage to a minion(assuming you rush into something). And if you don't attack its just a worse Magma Rager. Nice to see that Magma Rager got a job at Boom Labs.